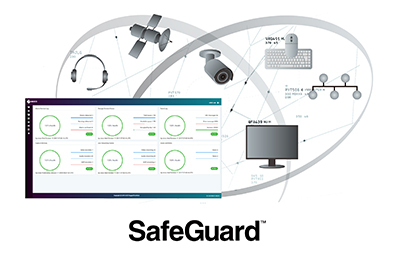 Altamonte Springs, Florida, February 27, 2018 – EIZO today announced SafeGuard – a data capture & content management solution designed to receive multiple feeds from communication interfaces employed in mission-critical environments such as ATC (air traffic control). It is an end-to-end system that provides a secure archive supporting the management, analysis, and distribution of data for industries facilitating Post Incident Investigation, Search & Rescue Operations, Training & Performance Analysis, and Verification & Validation. SafeGuard supports the capture and synchronous playback of audio (analog, digital, VoIP), radar (serial or network), keyboard and mouse, At-the-Glass video signals (analog and digital), CCTV camera signals, distributed network data, and more. The solution offers flexible content management with local and remote storage, programmable archive, and export features. The system management and features of SafeGuard are designed to operate in a web browser for supporting cross-platform operation. This allows remote network access between servers and management workstations so users can maintain centralized control of data capture, user profiles, system monitoring, and more. The web browser employs https and enhanced authentication measures to ensure that all transactions between the browser client and data server are secure. In high security applications where files are extremely sensitive, captured data may be optionally encrypted in primary storage. Based on the Linux OS from the outset, the SafeGuard server benefits from the enhanced security that comes with this operating system. This includes up-to-date protocols that follow the most recent security standards and compliance with relevant STIG (Security Technical Implementation Guide) standards. Users are allocated a unique user ID and password and are assigned specific system roles. Roles are configured to allow or deny access to various feature sets and/or functions based on operational requirements. This ensures that data can only be accessed and shared by users with sufficient privileges. SafeGuard’s interface supports touch screen monitors and tablets for an intuitive user experience. Mice and trackballs are also supported to provide a wide array of user access options. SafeGuard is designed from the ground up to be a highly configurable solution that can be built to meet specific customer needs. This allows future upgrades, expansion, or replacement while maintaining investment protection through backwards compatibility of interfaces. Options such as RAID configuration, dual PSU, redundant Ethernet, and Hot Swap components are all supported to provide flexibility and ease of maintenance. Furthermore, SafeGuard works seamlessly with EIZO’s ATC hardware solutions including monitors, encoding & streaming devices, and graphics boards. This provides users with a fully integrated end-to-end data management system with the assurance of smooth interoperability. EIZO will be showing SafeGuard for the first time at World ATM Congress 2018 in Madrid, Spain March 6 - 8, 2018. Visit booth 349 to see a live demonstration of the solution. SafeGuard is now available. Please contact atc@eizo.com for details. All product names are trademarks or registered trademarks of their respective companies. SafeGuard is a trademark and EIZO is a registered trademark of EIZO Corporation.